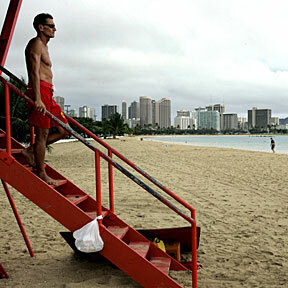 City and County lifeguard Bill Goding looked at an empty Ala Moana Beach Park from Tower 1B yesterday. Kona conditions, gray skies, onshore winds and occasional showers kept most people off the beach. She was on the phone with her mom when the mall shooting began. From a stubborn oven door to a bird in free fall, turkey disasters plague our Thanksgiving memories. Woods shakes off an illness to lead the Grand Slam by three strokes going into the final round. The Oahu Visitors Bureau held its annual luncheon at the Hilton Hawaiian Village yesterday. Two Board of Education members have revived their plan to allow advertising in public schools.